This Tour covers the northern part of Lombok and presents you the experience of nature, culture and human civilization in this region for centuries, you will embark on a tour through the coastline to visit Malimbu, then to Cape traditional market, diverse local markets with colorful fruits and foods are traded by local people for their daily living needs. 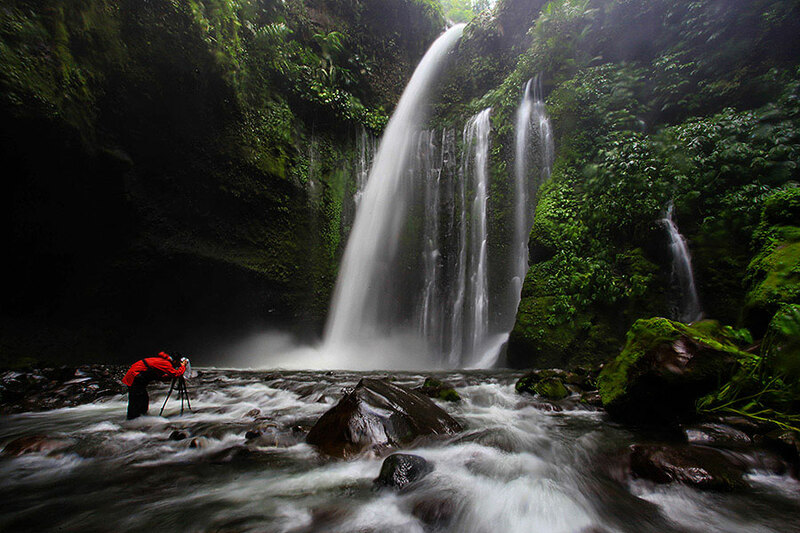 Sindang Gile waterfall, located in Senaru village located 600 meters above sea level at the foot of Mount Rinjani. The cool hills and quiet nature, giving you a comfortable rest, water flows and falls above an altitude of 30 meters down is the most beautiful waterfall in Lombok, the waterfall to irrigate rice field environment with crystal clear waters that come from the Lake Segara Anak. 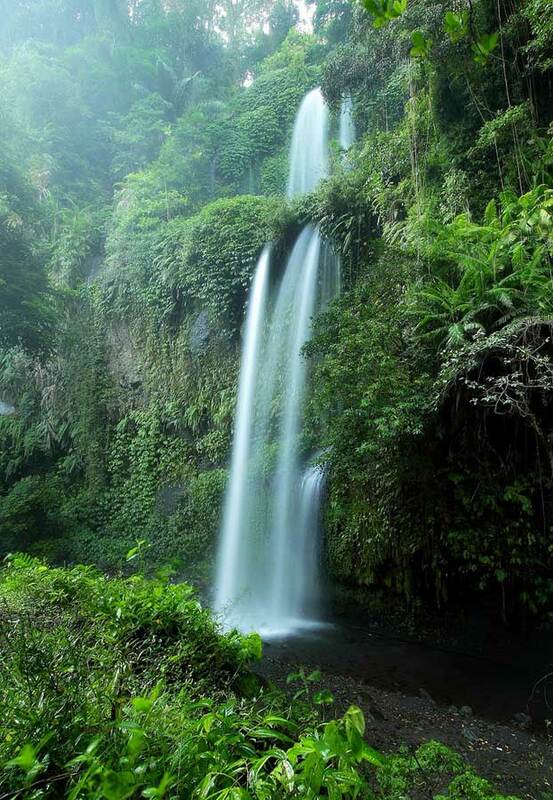 Sendang Gile waterfall is located fairly close to the entrance of the nature tourism to Lombok is. You simply walk as far back as 15 minutes. Because of its location near the entrance, Sendang Gile Waterfall is visited by more tourists. For those of you who do not like too heavy terrain, Sendang Gile Waterfall is the right choice for your visit. Along the road leading to the two waterfalls, you will be presented with a view of the lush forests. This forest is part of the National Park of Mount Rinjani. The majority of the flora that grows in this area is a tropical plant. Such as Bajur Tree (Pterocarpus SP. ), Ipil Tree (Insia biyuga), tree of Sentul (Sondarium), and Teak (Tektona grandis). Although dense and lush, you never worry about getting lost. Because the road to Sendang Gile Waterfall is very clear. But if you are in doubt, you can ask your local guides to point out the direction to the waterfalls Sendang Gile. The trail leading to the waterfall Sendang Gile majority be rung. It is quite convenient for you. But arriving at the waterfall, you should also be careful. Because around the waterfall, there is a lot of large rocks. If you are standing in a place that was a little higher, you could see water flow break up on the rocks. You can also sit back and rest on the rocks, enjoying views of the waterfall in front of you. For those of you who like a challenging trek, you can proceed to the waterfall Tiu Kelep. To achieve this, you have to walk as far as 45 minutes. You will pass through a staircase which is pretty steep. Afterwards, you will also cross the river shallow enough. On the river you will feel the coolness of water flow are very clear. You'll also travel the path, which is in looked to there is a small river with a quiet water flow. Really fun and fresh look! Your adventure will be perfect when it arrives at the location of the waterfall Tiu Kelep. This waterfall is quite high, which is about 45 meters. Its a pretty big and heavy raises the sea big enough anyway. If you do not want wet, you should wear your water resistant jacket. Not far from there, you can see a large tree that grows on the surface of cliffs. According to locals, the name Tiu Kelep Sasak language is taken from "Flying Pool" While the name Sendang Gile taken from local legend. The legend tells of a Prince who was being chased by a lion is crazy. The Prince then hide behind the waterfall to escape the pursuit of a lion. Eventually the waterfalls named Sendang Gile. The second waterfall believed to cure various ailments, as well as make look youthful. The local community also believe that the flow of the falls will be even greater if the people around him speak more loudly. The atmosphere is fresh and beautiful scenery will make you enjoy Lombok tourist location. But on the way home, stop briefly to Senaru. The restaurant is located at an elevation of, so you will get different views while tasting typical dishes of Lombok. Here you will be presented with a view of lush forests and cliffs that surround waterfall Sendang Gile and Tiu Kelep. -Sandwich Lunch Box to take a full day trip. The above Sendang Gile Waterfall, the trail leading to the waterfall Sendang Gile majority be rung. It is quite convenient for you. But arriving at the waterfall, you should also be careful. Because around the waterfall, there is a lot of large rocks. If you are standing in a place that was a little higher, you could see water flow break up on the rocks. You can also sit back and rest on the rocks, enjoying views of the waterfall in front of you. The above Tiu Kelep Waterfall, For those of you who like a challenging trek, you can proceed to the waterfall Tiu Kelep. To achieve this, you have to walk as far as 45 minutes. You will pass through a staircase which is pretty steep. Afterwards, you will also cross the river shallow enough. On the river you will feel the coolness of water flow are very clear. You'll also travel the path, which is in looked to there is a small river with a quiet water flow. Really fun and fresh look! For through this waterway you step on the stone on your feet is pretty slick and it is probably the therapy, and please be careful to follow several meters through the river.